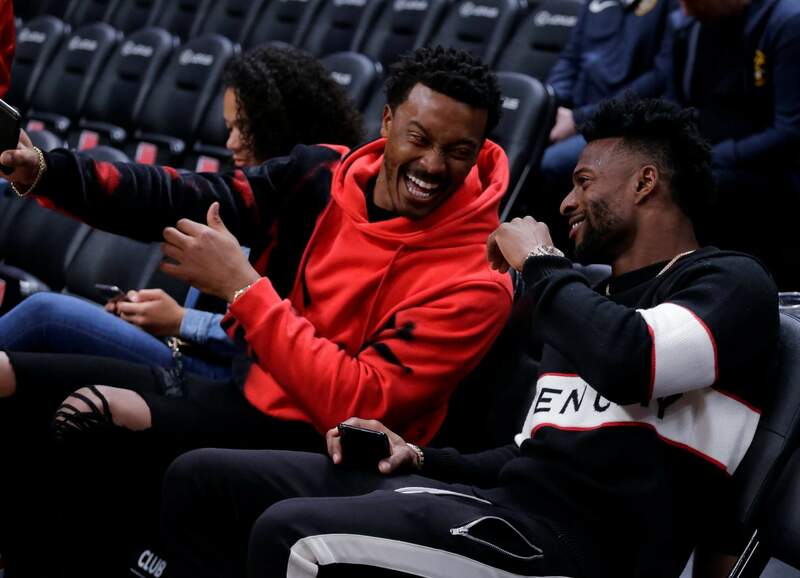 Denver Broncos’ Demaryius Thomas, left and Emmanuel Sanders, right laugh on the court before the start of an NBA basketball game between the Denver Nuggets and the Golden State Warriors, Sunday in Denver. ENGLEWOOD – The longest-tenured Bronco isn’t sure if he’ll be in Denver much longer as rumors swirl that wide receiver Demaryius Thomas is available as the NFL’s trade deadline approaches next week. On Monday, the Dallas Cowboys acquired 24-year-old Amari Cooper from Oakland for a 2019 first-round draft pick, taking the top available receiver off the market. Although Thomas, 30, is averaging a career-low 11.3 yards per catch as Broncos rookie Courtland Sutton carves out a bigger role in Denver’s offense, Thomas is tied with Emmanuel Sanders for the team lead with three touchdown receptions. Coach Vance Joseph said he doesn’t need to address the trade rumors with his players. “I don’t. I really don’t. It’s rumors. It’s gossip. It doesn’t matter to our football team, really,” Joseph said. “Our only concern is the Chiefs, and that’s on Sunday. But, this time of the year, I watched the games on Sunday obviously. There’s a lot of rumors out there, a lot of gossip, a lot of content for different shows. Joseph meets daily with general manager John Elway and said the boss hasn’t conveyed any trade talks to him. Thomas, who has a $12.5 million salary cap hit this year and a $17.5 million hit next season, said he’d be flattered if other teams are indeed inquiring about him. The Broncos (3-4) ended a four-game skid with a 45-10 rout of the Arizona Cardinals on Thursday night. It marked their first game scoring 30 or more points since Week 2 last season against Dallas. In between, they lost 15 of 20 games, the worst stretch of Thomas’ nine-year career in Denver. Thomas said he’s keeping his focus on Sunday’s game at Kansas City (6-1) even with next Tuesday’s trade deadline looming. “I play for these guys in the locker room, and the organization, of course,” Thomas said. “But these guys in the locker room keep my head on straight, help me not think about it and just go on about my business, control what I can control. That’s all I do. Every day, in and out, I can control what I can control. Thomas, who was selected 22nd overall out of Georgia Tech in 2010, three spots ahead of Tim Tebow, has been through five coaches – Josh McDaniels, Eric Studesville, John Fox, Gary Kubiak and Joseph – and seven starting quarterbacks – Kyle Orton, Tebow, Peyton Manning, Brock Osweiler, Trevor Siemian, Paxton Lynch and Case Keenum – in Denver. He started off slowly this year with a handful of drops through the first two games but has been solid and one of Keenum’s most trustworthy targets over the last month. Thomas said he was just too anxious early on. His preference, he said, is to finish his career in Denver. The Broncos officially placed LG Ronald Leary (Achilles) on IR and replaced him with G/C Nico Falah, a rookie from USC whom they signed off the Jets practice squad. ... Joseph said CB Adam Jones will return to practice Wednesday for the first time in two weeks. ... Injured players who are day-to-day are: S Darian Stewart (neck), RB Royce Freeman (high ankle sprain), WR DaeSean Hamilton (right MCL sprain), RT Jared Veldheer (knee) and OLB Shane Ray (right ankle sprain).